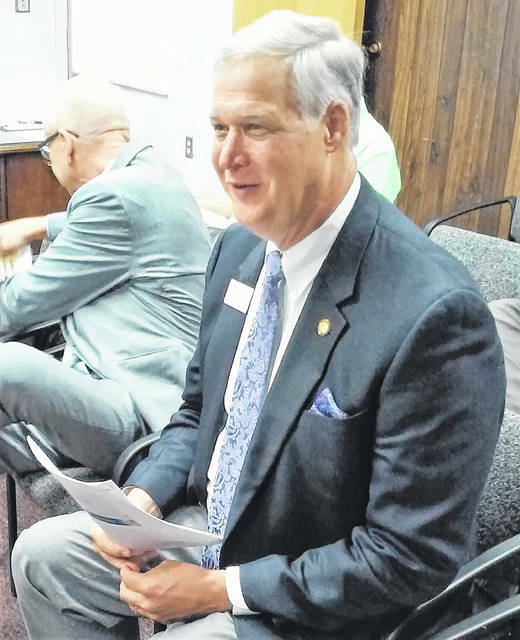 Great Oaks President and CEO Harry Snyder is pictured during Wednesday’s Highland County Board of Commissioners meeting. Great Oaks President and CEO Harry Snyder met with Highland County Commissioners during their Wednesday meeting to not only urge passage of a 2.7-mill operating levy, but to also change its status from renewal to continuing. Snyder said that the Great Oaks career campus system, which Laurel Oaks in Wilmington is part of, has demonstrated over the past three decades that it can live within its $64 million annual budget and yet has been able to complete building renovations, hire and retain staff, and update equipment without additional funding. He emphasized that the levy is not an increase, but simply a renewal at the current level of 2.7 mills, which was originally approved in 1988 and subsequently renewed in 1998 and 2008. Snyder added that about 18,000 adults use the Great Oaks facilities for recertification training and continuing education. Great Oaks’ approach to education, Snyder said, is guided by more than 1,400 business advisory members that recommend to a 35-member board of directors what programs should be offered to support the different career paths offered to students. Currently, high school students can choose from 31 career fields ranging from health care to public safety services, robotics, aviation maintenance and more, with the opportunity to earn college credit and professional licensure. In asking for renewal of the levy, Snyder pointed out the positive economic impact that the Great Oaks system has on the local and regional economy. According to a University of Cincinnati economic center study that was released back in January, the yearly economic return to Southwest Ohio from the Great Oaks system totals more than $115 million. Highland County Auditor Bill Fawley told the Times-Gazette that the typical agricultural or residential property owner could expect to pay $63.93 annually per $100,000 of property valuation, while that figure would be $85.82 annually per $100,000 valuation for commercial and industrial entities. Voters will make their decision on the Great Oaks levy during the Nov. 6 general election. https://www.timesgazette.com/wp-content/uploads/sites/33/2018/09/web1_CEO-Harry-Snyder.jpgGreat Oaks President and CEO Harry Snyder is pictured during Wednesday’s Highland County Board of Commissioners meeting.